The project was well packaged, and came to me delivered as undamaged. The finished 'railroad spike' shelf&items rack is truly magnificent.....it is beautiful! Both the craftsmanship and the 'old wood patina' is most pleasing to the eye. I am overly pleased. ......and, it makes my leather furniture look good. I would suggest to you that my 4spike length shelf is quite heavy (quality old wood) - and care be taken to its mounting. I am going to secure mine to wall studs. I wish to have ordered a 5spike length - but still quite satisfied. This industrial style desk is custom made to order and features a sturdy welded steel tubing base with a solid wood top and shelves. It is built to last and can be made in any configuration to suit your exact requirements (left or right side shelves; various dimensions, etc.). SPECIAL NOTE: Unlike similar products on the market, our custom desks feature premium quality wood, metal and hardware. 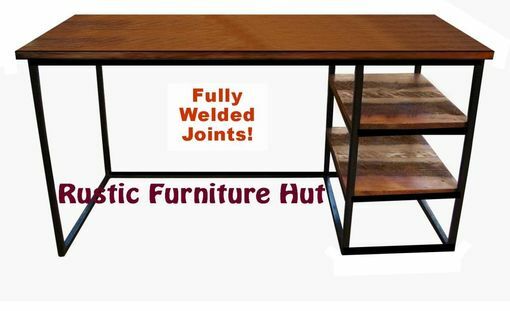 All flat surface welds are ground smooth, and all wood edges are either beveled or rounded (there's no "ouch!" with our desks). - Solid wood for desk top and shelves. - Fully seal welded steel base (helps prevent oxidation). - Rubber foot pads to protect floors. - Left or right side shelves -- your choice! - Custom made to order in any size. - Many wood finishes are available. - Butcher block style wood. - Standing desk or other custom heights. - Powder coated steel finish (various colors available). - Custom metal patina finishes. - "L" shaped 2-desk configurations. - Individually handmade by Rustic Furniture Hut in California. - Have one custom made just for you -- contact us today! Every maker has a story. 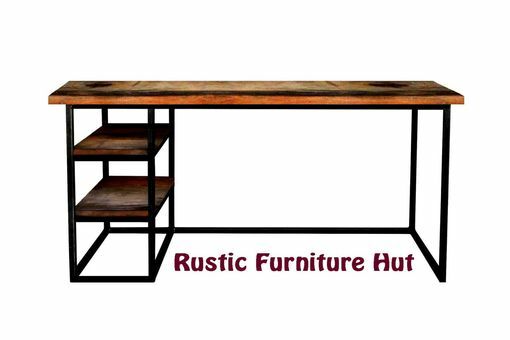 Be a part of Rustic Furniture Hut's story by placing an order, leaving a review, and seeing your review appear here.